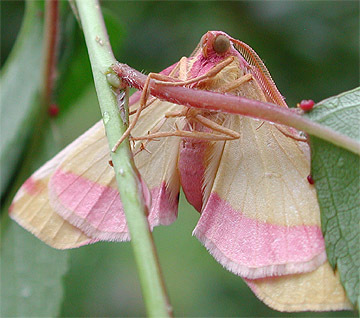 This is the second plagodis on the site and yet another moth with that attractive color combination of rose and yellow. (Rosy Maple Moth, Chickweed Geometer). 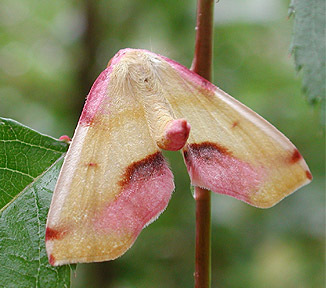 These geometrids feed on a variety of hardwoods and are pretty common in the Northeast. It's not unusual to see these moths (and others) at rest with the abdomen curved upward. This pose is common in females attempting to thwart males' mating attempts. *Thanks Harry Zirlin and Dave Wagner for the input.